(WikiCommons/CNS photo: Jim Lo Scalzo, EPA). A new biography of the former White House advisor Stephen K. Bannon released this week includes some surprising revelations by Mr. Bannon regarding his embrace of Catholic spirituality. 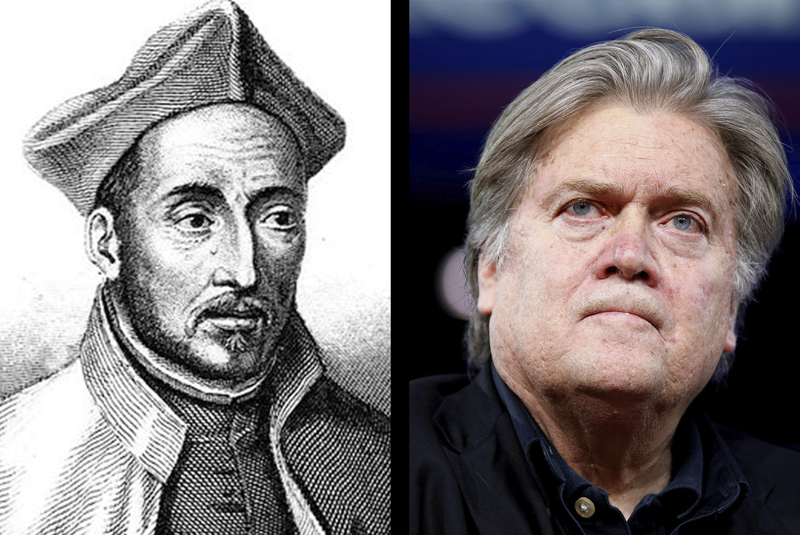 Specifically, Mr. Bannon, a notorious figure among many American Catholics, credits his daily practice of the examen, a meditative daily exercise recommended by St. Ignatius of Loyola in his Spiritual Exercises, with helping him quit drinking and abstain from alcohol for over 19 years. While Mr. Bannon has publicly stated in the past that his Catholic faith significantly informs his worldview, he has been strongly criticized by many Catholics, including bishops, for his championing of public policies rooted in anti-Islamic and white nationalist worldviews, as well as for his support for draconian policies aimed at curbing government assistance to the poor. Mr. Bannon supported President Trump’s proposed “border wall” with Mexico as well as the president’s attempts to ban citizens from certain Muslim-majority countries from entering the United States. Mr. Bannon has prayed the examen every day since he stopped drinking, Mr. Koffler wrote: “He generally performs it in the morning and later reviews the day, through its perspective, at night. He has even done the full four-week program ‘probably ten times,’ though never in isolation at a retreat.” The book does not mention any Jesuit mentors or spiritual directors, though Mr .Bannon earned a master’s degree from Georgetown University’s School of Foreign Service in 1983. Normally, the full Spiritual Exercises take place in the context of a 30-day silent retreat held in isolation at a retreat house, with the retreatant typically praying for several hourlong sessions a day, with specific meditations and Scripture passages. The retreatant maintains strict silence during the retreat, even during meals, with the exception of a once-a-day meeting with a spiritual director for up to an hour to discuss the retreatant’s experiences during the meditative prayer periods. All Jesuits undertake the full 30-day Spiritual Exercises during their first two years in the Society of Jesus, a period known as the novitiate, and then customarily do an eight-day retreat on the same principles every year. They will also do the full 30-day retreat again a few years after they have completed their training, and some Jesuits have recently started doing the retreat again later in ministry. But only rarely would anyone do the Exercises, an extremely rigorous spiritual experience, more than three times in their life. Many other Catholic religious institutes (particularly those with an Ignatian charism) also use the Spiritual Exercises, and Catholic retreat houses throughout the world also offer Ignatian-themed retreats. When St. Ignatius first wrote down the Spiritual Exercises, he made it clear that they were not just for Jesuits but were a gift to the whole church. At Father Dowling’s death, Bill Wilson called him “the greatest and most gentle soul to walk this planet” and said “I was closer to him than to any other human being on earth.” Father Dowling told his own Jesuit superiors that he saw numerous parallels between Wilson’s writings and the “rules for discernment” found in Ignatian spirituality. Father Weston, however, cautioned that “quitting drinking is a little like ‘Step Zero’” for many people who have given up alcohol: “Recovery is a lifetime process, and there is a lot more to not drinking than not drinking. There is rage and rigidity, and of course isolation and arrogance [to deal with]. An outstanding achievement for anyone. I wish Mr. Bannon well in staying the course. Dominic Deus here. Chuck--what course is that? If Steve Bannon is doing a daily self examination, what could he possibly be finding? I'm reminded of that old saying "Some men serve best by staying drunk." Given this comment of yours , your use of your pen name avatar is more than oxymoronic.....the again, perhaps it's just moronic! All good spiritual devices have their proponents who may actually have no clue as to the intent or the genuine meaning of the device. Bannon and the Examen are a perfect example. In the Exercises, St. Ignatius talks of the Presupposition: " . . . let it be presupposed that every good Christian is to be more ready to save his neighbor's proposition than to condemn it . . . if he means it badly, let him correct him with charity . . . " This man has no clue what that presupposition means, no clue. His public persona, varnished now in the veneer of one who "practices" the Examen bears no resemblance to anything Jesuit. And he's not comfortable with a spiritual director. Of course not. There he would be called to radical candor, not political/spiritual tomfoolery where his arrogance knows no boundaries. It isn't alcohol that clouded his judgment, it's his thinking. No Examen seems adequate to fix that. I believe you provided your own self critique when you quoted Ignatius......"let him correct him [his neighbor] with charity...."
I keep rereading your comment and have yet to find"the charity". Wow- the same arrogant Steve who has no problems or shame pushing for people to vote for a candidate who stands accused by multiple 'very young' women of having sexually harassed them- who has no shame in denying health benefits for millions- that same man has the gall to consider himself a Catholic? How to give the Church a bad name.. It seems to me that the "examine" is oriented to discovering God's will and determining to do it. It is thus looking out from one self towards others in the presence of God. This narrative strikes me as looking in at oneself to determine how to be successful in Steve Bannon's life. I am certainly happy that he was able to modify his use of alcohol but am struck by the lack of any thing in this narrative that describes how he modified his dealings with others. It suggests that he is describing a tool to remove blemishes from himself for himself. I pray that he continue his use of the examine but expand its scope in his life. We all could use a good guide in this endeavor. James T. Keane is a senior editor at America Media.